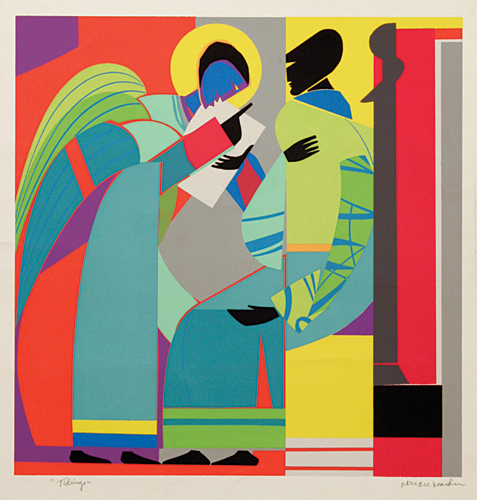 I knew very little about Romare Bearden before I went to see Impressions & Improvisations: The Prints of Romare Bearden today at the Nelson-Atkins Museum of Art. One of my artist friends who works in printmaking raved about him and his use of colors and techniques. We went together to a pre-exhibit printmaking demonstration given by Kathy Caraccio at the beginning of last month. 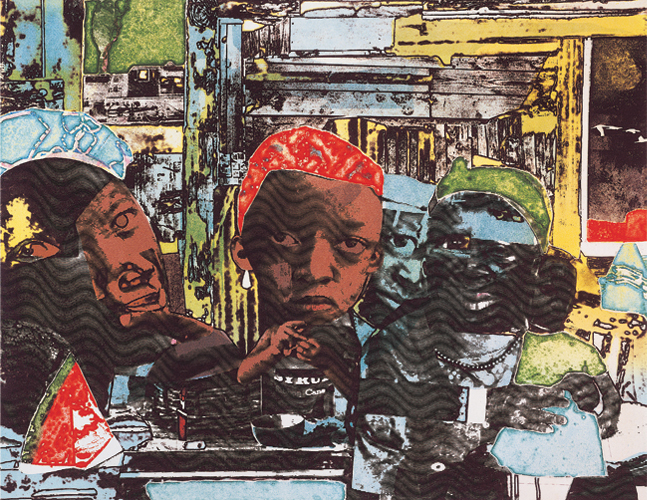 She had worked with Bearden and mixed bits of print-making knowledge in with her personal remembrances of Bearden. He seemed an interesting person, but I still hadn’t been exposed to any of his art until today. Impressions & Improvisations features more than 70 works which Bearden created over a period of 30 years. The exhibition was divided into two main categories: one concentrating on exposing Bearden’s process, which he considered as important as the finished art, and one focused on exploring the themes of his art. In the process section, I was greatly interested to see The Train (pictured) and The Train Suite – 12 pre-prints Bearden had created on his way to making the image he ended with. The Train is etching and aquatint, but was based on a collage Bearden made. He then etched the photographic negative image of the collage onto many copper printing plates that were then fused together. A second run through the press created the colors in the image, made to imitate watercolors. This is just one example of the creative ways Bearden used different mediums and techniques to make one-of-a-kind artworks. In the thematic section, artwork was divided into the following categories: African Themes, Beauty of Black Women, Jazz & Blues, Greek Myth, and Religion & Ritual. I especially enjoyed Bearden’s imagery of black women. My favorite in that section was The Lamp, in which a mother and child read by lamp light, for its vibrancy and peacefulness. 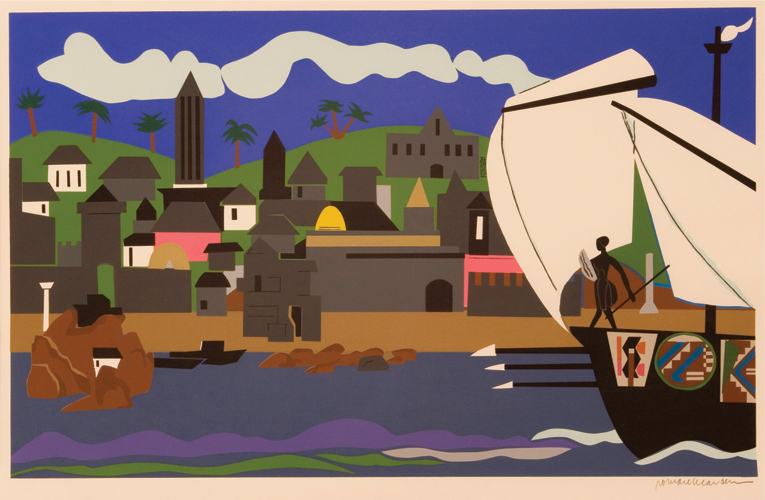 I was surprised to learn that Bearden had created an entire series of works representing the adventures of Odysseus as a African warrior (see Home to Ithaca to the left), and was intrigued by how Bearden had made the ancient myth his own. The Jazz & Blues prints were inspired by Bearden’s experience of the music in 1930s Harlem, and reflect the musical collaboration and improvisation of that time. Two of the most captivating images in the Religion & Ritual section were Tidings (pictured at top of article) and Noah the Third Day, a print in which the swirling flood waters cover half of the image leaving Noah and his ark floating precariously at the top. All together, the exhibition was an explosion of colorful imagery and intriguing glimpses into Bearden’s artistic process — a delight for the senses and the mind. 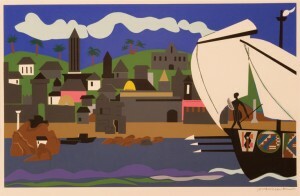 You can see Impressions & Improvisations: The Prints of Romare Bearden at the Nelson-Atkins Museum of Art through January 8, 2012.